The current research is the study and analysis of the concept of expression in the contemporary Iraqi ceramic composition. The research is divided into four chapters, the first of which includes the methodological framework of the research and the problem of research, which is summed up by the following question: What are the meanings of expression in contemporary ceramics? As well as the importance of research and the need for it and the research objective of: the detection of the meanings of expression in the composition of contemporary Iraqi ceramics, the limits of research and terminology. 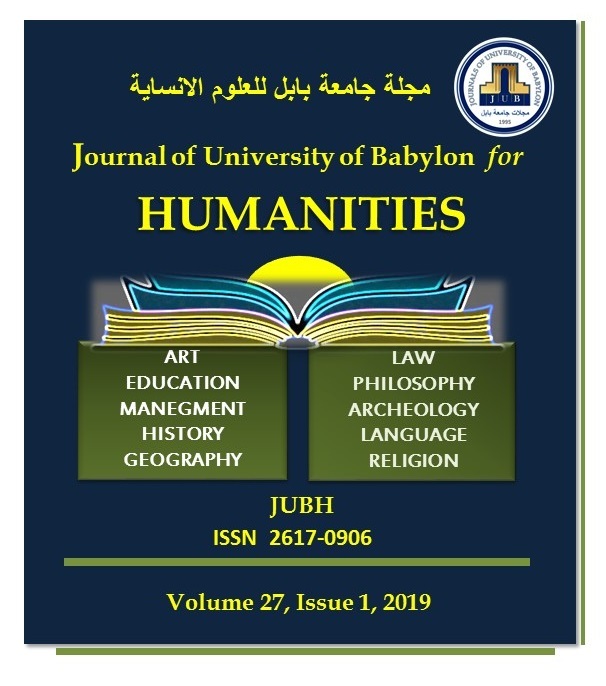 The second chapter, the theoretical framework of the research, was damaged in two ways: 1 - the concept of expression and composition in art 2 - the origin and development of the art of contemporary Iraqi ceramics, as well as the indicators that ended the theoretical framework. The third chapter (research procedures) included the research community, the research sample, the research tool, the research methodology, and the analysis of the research sample of (6) works of the products of contemporary Iraqi ceramics. The fourth chapter included, the results of the research, conclusions, recommendations, proposals, proven sources of research. H. Majhool, “Expression in the Contemporary Iraqi Ceramics Composition”, JUBH, vol. 27, no. 1, pp. 269 - 283, Apr. 2019.